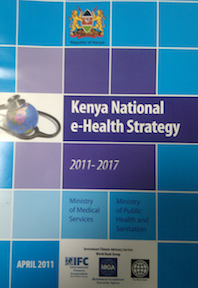 During the month of August 2011, one of the many developments in the national Health and ICT scene was the launch of Kenya's National e-Health Strategy 2011-2017. The vision of the strategy is “To develop efficient, accessible, equitable, secure and consumer friendly health care services enabled by ICT”. The strategy also outlines a mission to “promote and deliver efficient healthcare services to Kenyans and consumers beyond our borders, using ICT”. Hon. Peter Anyang Ngong'o – Kenya's Minister for Medical Services officially launched the strategy on 11th August 2011. The newly launched strategy seeks to set in motion a process of compensating for the shortage of skilled health care professionals by harnessing ICT for improved healthcare delivery. It also aims to tap into the latent capacity of healthcare consumers to play an active role in the protection and management of their personal health. The strategy also leverages the imperative for the government to provide quality healthcare for all its citizens to build a nation with increased economic and social productivity. These underlying themes constitute a requisite mindset to begin addressing the failures of the country's National Health Sector Strategic Plan - NHSSP I (1999 – 2004) and NHSSP II (2005 – 2010). Although the document does not take time to elaborate specific roles and expectations for these pillars in the conceptual framework, the strategy acknowledges that the pillar will include technology service overlaps and that interventions might cut across pillars. Stakeholders involved in development of the strategy prioritised the Health Information Systems Pillar for implementation. Indeed this is a clever move because it targets to build on progress made by the Ministry of Health’s division of health information systems to access some low hanging fruits. Arguably it appears to be a politically clever move to focus the Division of eHealth and Continuous Professional Development (CPD) and the Division of Health Information systems on the same objectives. Curiously, this subdivision of functional domains seems to relegate health management information systems (HMIS) in which significant progress has been achieved with the ongoing national roll-out of DHIS2 (username and password available from HIS division). One more notable inclusion in the strategy is a phase to design the Enterprise Architecture for e-Health Strategy implementation. Depending on how well this is done, persistent concerns among stakeholders such as effort replication, implementation silos and unproductive undercurrents on tools selection should be a thing of the past. The strategy was developed by the Ministry of Medical services in conjunction with the Ministry of Public Health and Sanitation and with the support of the World Bank Country Office. There also seems to have been a fair attempt to make the strategy development participatory. This was championed by Dr. Esther Ogara, Head of the eHealth and CPD division. Listed contributors to the strategy included physicians, pharmacists, ICT experts, supply chain experts, economists and development workers.